Nice DJs from all over the world! 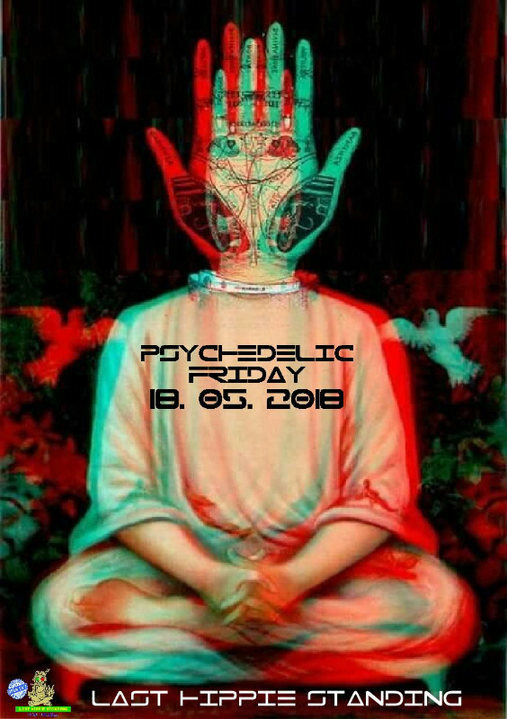 Psychedelic Friday is more then just a party or a night-out, it is a unique chance to experience Tribal Gathering and Psychedelic Adventure! Get yourself ready to dance all night long by PSYCHEDELIC vibes. We use word psychedelic to describe mind expanding influence over person, don't get it wrong! The sun of psychedelic music is rising at a dashing speed and spreading its light in multiple colours and shapes. As an important part of its growth and development, LAST HIPPIE STANDING is happy to serve as the ray of light, guiding and uniting a community of creative thinkers, open minds and loving souls in the multiverse of psychedelic trance. The desire to find something real -- to connect with something or someone -- is what drives us all. Join us on an adventure to a mystical paradise of imagination and fantasy! Trance music is as old as the human race, maybe even older, forms of it can be found in any culture, from the African tribes to the Vikings, from the Moroccan snake charmers to the Jewish Hasidim- it was always there. The beat was always there, engulfing human bodies and mind. Today it.s just coming back to us, using new tools, computers and electronics. In trance music there are no lyrics, you.re left with the music and your mind, mind and imagination- trance music is the background, the soundtrack to your own movie, and you can make of it whatever you want to- there are no limits! in 0.136 seconds server time.